"The shape is ideal for heat circulation and it has 363 inches of cooking space." "Perfect for camping, picnics, and small spaces." "Smoke locks ensure that you won’t lose the flavorful smoke while cooking." "Gives you plenty of cooking space despite the modest price." "The rounded rectangular shape gives you plenty of space for your meat." "The heavy cast iron retains heat so you won’t need as much coal." "Heavy ceramic creates an oven-like interior for roasting and baking." "The multiple cooking adjustments make this grill ideal for searing." Weber has been the name for charcoal kettle grills for generations, for good reason. The shape is ideal for heat circulation, and the 22-inch diameter round grate gives you 363 square inches of cooking space. The grate has a hinge, so you can lift a small portion to add coals while cooking, which is great for long, slow cooking sessions over indirect heat. The ash catcher keeps the remains of the burned charcoal contained, so you won’t get a shower of ash with every breeze, but it’s very easy to empty when cooking is done. The handles are glass-reinforced nylon and they have heat shields, so the handles won’t get overly hot during cooking. Aluminum dampers let you adjust the heat level, and closing the dampers cuts the supply of oxygen to extinguish the coals when cooking is done. This has sturdy wheels so you can roll the grill into place for grilling, and into storage when grilling season is done. Weber grills are built in the USA, although component parts may be sourced globally. Compact and lightweight, this grill is perfect for camping, picnics, and for anyone who doesn’t have space for a full-size grill. It has a nickel-plated steel cooking grate that gives you 160 square inches of cooking space, and a glass-reinforced nylon handle that stays cool while you cook so you can lift the lid without needing a mitt. Two dampers help you control the heat during cooking. The body of the grill is porcelain enamel coated steel that resists rust and looks attractive. The plated steel legs keep the grill off the table or ground during cooking, then fold up to hold the lid in place when cooking is done, securing any mess inside while you carry the grill home. It’s lightweight enough to carry with one hand and small enough to fit in the trunk of your car. Since it’s so light and compact, it’s easy to clean—just wash the grates in the kitchen sink, and tip the grill to empty the ashes or give it a quick wash and scrub with the garden hose. When it’s time to take your outdoor cooking to the next level, this charcoal grill will have you smoking your own ribs, chicken, and more. With a whopping 1795 square inches of cooking area, you’ll never run out of space for family dinners or parties. The two-lid design means you can check half of the grill without releasing all of the heat, while the smoke locks ensure that you won’t lose the flavorful smoke during long, low-and-slow smoking sessions. The large side box can be used either for wood chips for smoking or as extra cooking space when you’re feeding a crowd. Made from heavy gauge steel, this holds heat in during cooking and the integrated thermometer lets you easily check the temperature throughout the cooking time. The grates are pre-seasoned expanded metal, so you can start cooking right way. The front and side tables, as well as the bottom shelf, are also expanded metal. Large, 16-inch wagon-style wheels and an extra-large handle make this easy to move into place, despite the heavyweight construction. This barrel-style grill gives you plenty of cooking space, despite the modest price. You’ll have 793 square inches of cooking area on the cast iron cooking grates, while the metal side and bottom shelves give you plenty of space for tools, sauces, plates, and more. The top chimney and side vents let you adjust the temperature, airflow, and smoke, so you can cook all your favorite recipes, while the integrated thermometer lets you monitor the temperature so you know your adjustments are correct. The charcoal grate is also adjustable, so you can cook closer or further from the direct heat. When cooking is done, the ash pan makes it simple to clean the grill, while the large wheels make it easy to roll the grill into place for cooking, or into a storage space when grilling season is over. This grill is modeled after a 1905’s design, yet it still looks sleek and modern. The rounded rectangular shape gives you enough space for roasts, racks of ribs, or plenty of burgers, steaks, and sausages on the 300 square inch cooking surface. The shape also makes it great as a smoker, simply by arranging the fuel for slow, indirect cooking. Two top and two bottom vents let you regulate the cooking temperature, and when cooking is done you simply close the vents to extinguish the coals. Made from cast aluminum, this is lighter in weight than similar steel grills, yet you can leave it outside in any weather without worrying about rust or corrosion. 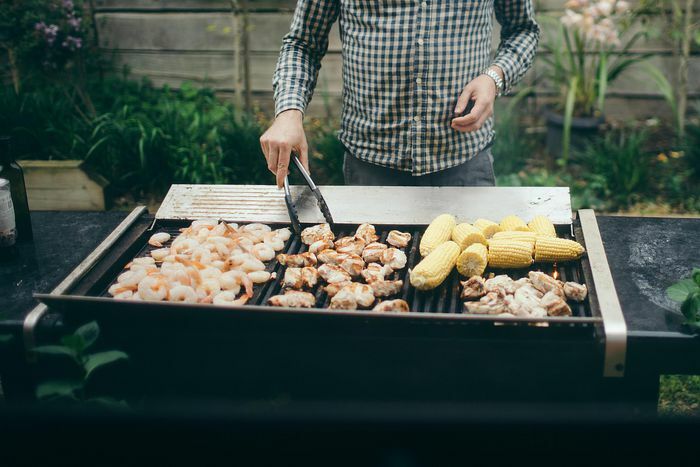 When it’s time to move the grill, it’s easy to remove the grill from the cart if you want to toss it into the car trunk, or just lift the cart handle and roll the grill across your deck or lawn with the two sturdy wheels. As great for travel as it is for back yard cooking, this compact cast iron hibachi-style grill is incredibly durable. The heavy cast iron retains heat, so you’ll need less coal, and it will last a lifetime. The small size is perfect for a couple of steaks or burgers for the family, then it’s easy to move into storage again, using the attached handle. For heat regulation, this has a draft door, while coals can be accessed via a flip-down door, so you can add coals during cooking. The grill can be adjusted to two different heights, so you can grill closer or further from the heat source. This grill comes pre-seasoned, but the grates will become better seasoned and more nonstick with continued use or with additional seasoning. Kamado grills are a whole different cooking experience, able to do more than standard charcoal grills. The heavy ceramic retains and radiates heat, creating an oven-like interior for roasting and baking, so it’s perfect for your steaks, burgers, roasts, and even for baking bread or cooking pizzas. They’re also great for low-and-slow smoking. This has 604 square inches of cooking space on two tiers. For easy cooking, this has an electric starter port, so you’ll have it lit and ready to cook in no time, and when cooking is done, the removable ash drawer makes it easy to clean. Two draft vents let you regulate the heat, and the grates are stainless steel, so they won’t rust or corrode. This has two fold-down shelves that give you space for tools and condiments, then they fold down to save space when the grill isn’t in use. The cart has locking wheels, so you can move it into place, then lock the wheels so it won’t move again. A heavy duty vinyl cover is included, so you can keep it clean when not in use. The multiple cooking adjustments make this grill ideal for searing and finishing steaks or chops, and for cooking all your other grill favorites, as well. It has a total of 780 square inches of cooking space, with 490 square inches on the primary grates and 205 inches on the secondary grates. There’s no need to lift the lid or move the grates to add charcoal since there’s a front door that lets you add or move the coals while minimizing the loss of cooking heat. The fire pan can be raised and lowered to six different levels, so you can easily cook closer or further from the heat source, for more or less direct heat. Adjustable dampers and a smoker stack offer even more options for controlling the level of heat as well as the heat flow, so it’s simple to start at high heat and finish with low-and-slow, for the perfect result every time, while the integrated thermometer lets you monitor the temperature throughout the cooking time. Two side tables give you space for tools, plates, and sauces, then they fold down to save space when the grill isn’t in use. When cooking is done, a large ashtray that spans the entire width of the grill makes it easy to dispose of the ashes. 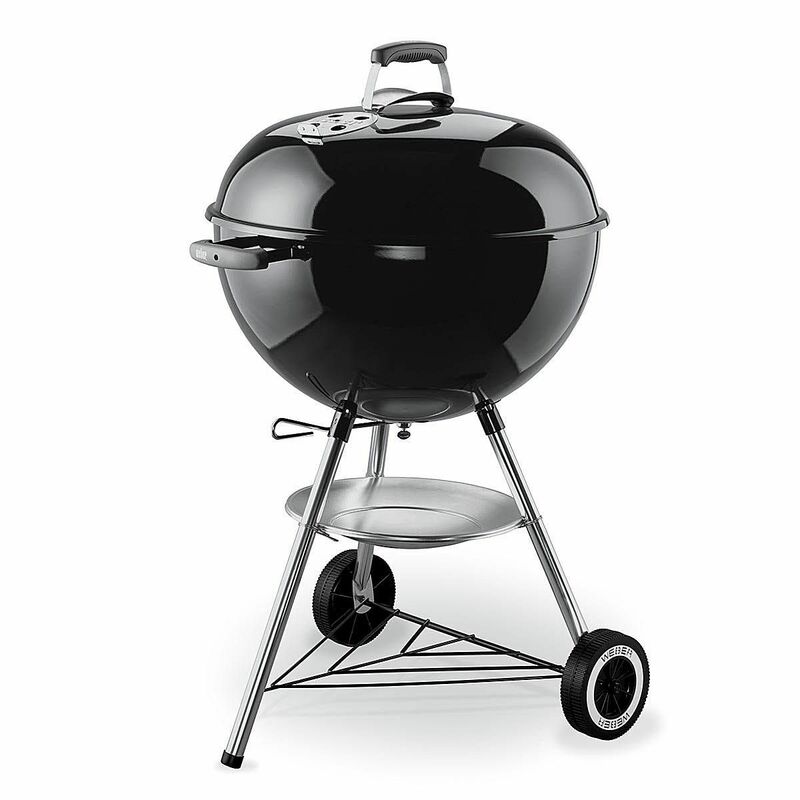 Our writers spent 5 hours researching the most popular charcoal grills on the market. 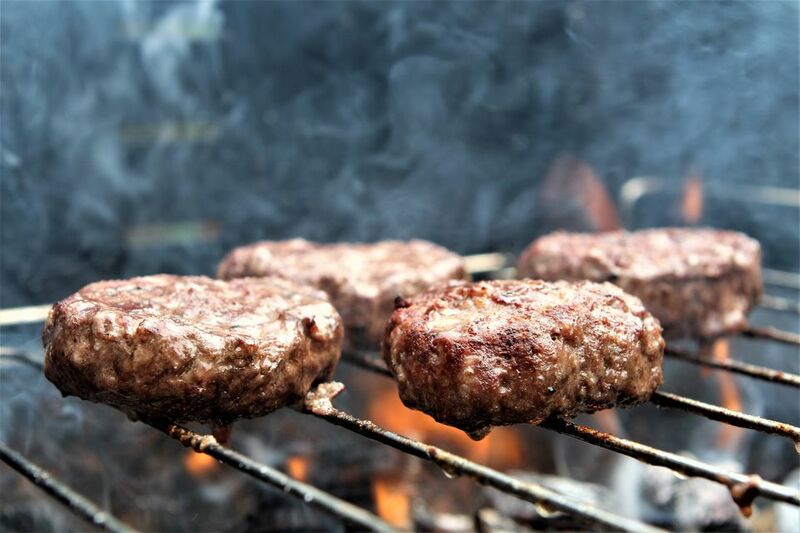 Before making their final recommendations, they considered 14 different grills overall, screened options from 8 different brands and manufacturers, read over 20 user reviews (both positive and negative), and tested 1 of the grills themselves. All of this research adds up to recommendations you can trust. Is the Weber Original Kettle Premium 22 Charcoal Grill Worth the Fee?